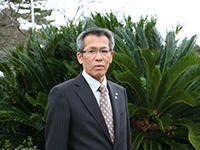 I am honoured to succeed President Matsuda as the president of the Oki Islands UNESCO Global Geopark Promotion Committee. Long known for its historical importance as the land of exile for emperors Godaigo and Gotoba, Oki was recognized for its rich natural landscapes in 1963 with its incorporation into the Daisen-Oki National Park, and became a popular sight-seeing destination. However, as Oki underwent changes over the years, the number of tourists coming to Oki continued to decline. We hoped to revitalize Oki through geopark activities, successfully becoming a Japanese Geopark in 2009 and then a Global Geopark in 2013. In November of 2015, the Oki Islands was officially recognized by UNESCO, and has since been undertaking new initiatives as a UNESCO Global Geopark. Oki is home to geographical features that can teach us about the development of the Japanese Archipelago, the phenomena that transformed Earth’s environment, and what lies beneath the earth’s crust; it’s home to a mix plants and animals of northern, southern, continental, and mountainous regions all living together in the same unique ecosystem, and to obsidian that unlocks thirty-thousand years of history. Our greatest wish is to hear people say they were glad to be born in, live in, or spend time in Oki. With this goal in mind, the Oki Islands UNESCO Global Geopark endeavours to share the appeal of Oki through our three main themes: tens of thousands of years of geohistory, a unique ecosystem where northern and southern plants and animals coexist, and starting with obsidian, lifestyles and traditions continuing from ancient times.